Light scattered from the dust particles in the comet's coma illuminate outlines of the structures on the comet's southern side. The image was captured on Sept. 29 from a distance of about 12 miles (19 kilometers). 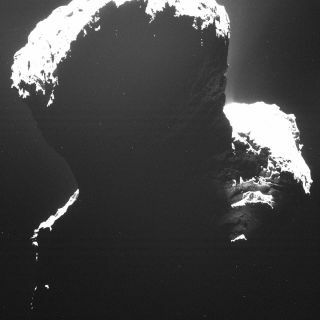 Europe's Rosetta spacecraft has finally captured the first images of its target comet's mysterious southern side. The Rosetta probe has been studying Comet 67P/Churyumov-Gerasimenko for months, but the comet's southern side has always faced away from the sun, cloaked in darkness. Now, dust particles in the coma surrounding the comet have scattered light and allowed a fuzzy first glimpse at 67P's dark side. The shadow effect happens because the comet's axis of rotation is not perpendicular to its orbital axis, so patches of the surface have remained covered in darkness for months, researchers said. The phenomenon is called "polar night," and the same thing happens at Earth's poles. However, the polar night lasts only a few weeks on Earth. On Comet 67P, the southern side won't be fully illuminated until May 2015. "During perihelion [closest approach to the sun], when 67P comes within approximately 186 million kilometers (about 116 million miles) of the sun, the comet’s southern side is illuminated and thus subjected to especially high temperatures and radiation,"OSIRIS principal investigator Holger Sierks said in a statement Thursday (Nov. 6). Until then, astronomers can only see a fuzzy outline of the structures that dot the surface on the comet's southern side. A regular camera would not be able to capture the scattered light from dust particles, because it could record just eight bits of information per pixel and discern only 256 shades of gray. OSIRIS, on the other hand, can capture 16 bits per pixel and distinguish 65,000 different shades of gray, researchers said. "In this way, OSIRIS can see black surfaces darker than coal together with white spots as bright as snow in the same image," said Maurizio Pajola, the OSIRIS team member who first spotted the image. Rosetta's imaging system OSIRIS captured this image on Oct. 30 from about 19 miles (30 kilometers) away from Comet 67P/C-G.
Astronomers can also exploit OSIRIS' wide range to gather information from other images where spots on the comet are only temporarily shaded. Next Friday (Nov. 12), Rosetta will deploy a lander called Philae to touch down on the smaller of the comet's two lobes and begin taking surface samples. Rosetta is expected to fly in tandem with the comet until at least December 2015.